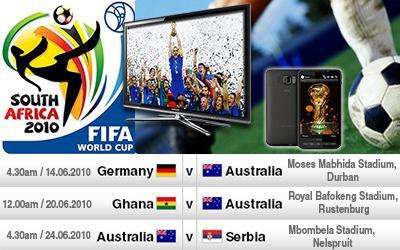 Everything you need to know about the upcoming 2010 World Cup in South Africa: 3D TV, iPhone apps, the best social-networking sites and more! Fox Sports debuted 3D soccer Australian broadcasts during the friendly match between the New Zealand All Whites and the Socceroos; it was followed quickly by Nine Network's 3D broadcast of the State of Origin. Ericsson's technology helped make the 3D broadcast work, and now the company is working with Cisco and ESPN to bring the World Cup to viewers in Full HD 3D. SBS, the sole broadcaster of the World Cup in Australia will be bringing all the live game action to your living room across its range of channels, including a specific channel for 3D matches. Now it's just a matter of finding what TV to watch it on. We've rounded up the best LCD and plasma screens for watching the world game (including the latest in 3D TVs) and the best projectors for those who want an even bigger picture. We haven't forgotten those of you trapped in the office at game time — if you can't watch the game live then the next best thing is to fire up your DVD recorder or PVR to ensure you don't miss any of the action! Social networking will put overly opinionated football fans in contact with each other to provide running commentary on the World Cup, as well as the occasional entertaining flame war. You'll also be able to follow the cup using your smartphone , thanks to a range of World Cup iPhone apps and the online streaming of matches. If none of this is exciting to you (if you're that one in a million) then perhaps the future of the World Cup will entice you into football fever: 3D is all the rage right now, but the future may be holographic. That is, if Japan gets the 2022 World Cup. Let's all cheer on Japan, I say.